How to use homemade baits to get those pesky ants! How to discourage ants from entering your home. 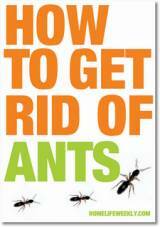 How to get rid of ant mounds. How you can use common things you probably already have in your home to get rid of ants, you would not believe what you can use! How to use tried and tested natural, herbal ways to get rid of ants, as well as chemical methods. How to protect your home from future invasions. How to eliminate nests once and for all. How to get rid of all types of ants including Carpenter and Fire Ants.